Shields against sparks, splatter, and slag. The CarbonX 8861 Welding Blanket Felt provides an extraordinary level of protection against grinding sparks, weld splatter, and welding slag. It was designed for use in the automotive aftermarket but has been implemented in numerous applications that require high-heat protection and insulation. Constructed using Pre-Oxidized Pan, the felt material is chemical resistant and inherently flame resistant, with a continuous operating flame temperature up to 1800°F. It is produced within TexTech Industries, including the blending, needling, and other finishing processes. CarbonX meets all No Melt, No Drip requirements for flame-resistant PPE. Click here for more information about our 8861 Welding Blanket felt, including testing data. 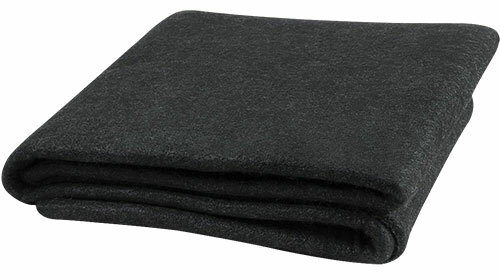 The CarbonX 8861 Welding Blanket Felt has a material weight of 16 oz/yd2 and a thickness of 0.220” (5.59mm). CarbonX has the advantage of being a signature brand of TexTech Industries Inc., a leading developer and manufacturer of performance-driven materials. TexTech's global distribution platform and in-house engineering, testing, and manufacturing capabilities facilitate the development of new CarbonX products to meet the requirements of a broad range of difficult and demanding protective applications.